The supply of Westside detached homes in July is down 4% from June (804 from 840) but up 10% compared to July 2017. Westside detached home sales this July were down 31% from June (75 to 52) and down 30% compared to 74 sales in July 2017. This year, sales volumes are off 82% from sales in Apr. 2016 (pre foreign buyer tax). July and August are usually slower. 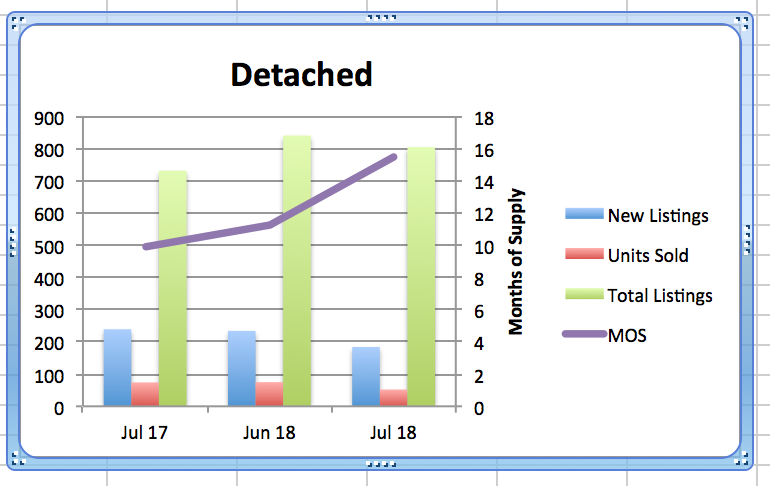 The increase in supply and decrease in demand has resulted in an increase in Months of Supply (MOS) to 15.5, from 11.2 last month which is also up from 9.9 last July 2017. (Usually a balanced market is in the range between 4-5 & 6-7 MOS with prices rising below 4 MOS and falling above 7 MOS). 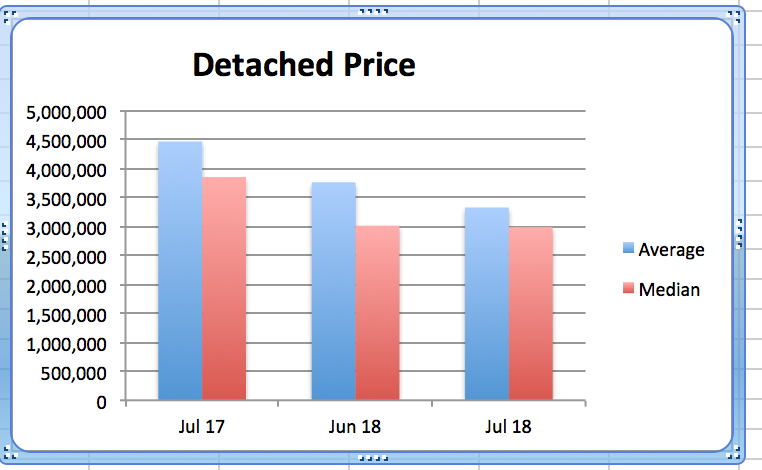 With MOS increasing this month, detached home prices have dropped 11.6% to $3.323M from $3.757M on average and the median was down slightly from $3.009M to $2.984M. This is a drop of 25% on average & 22% on median from the highs in 2017. If demand stays low, MOS will stay high and that will continue downward pressure on prices. The highest sale price for a Westside detached home in July was $8.5M. The lowest price was $1.4M. Of those sales, 4 received the asking price or more and 48 sold below the asking price. 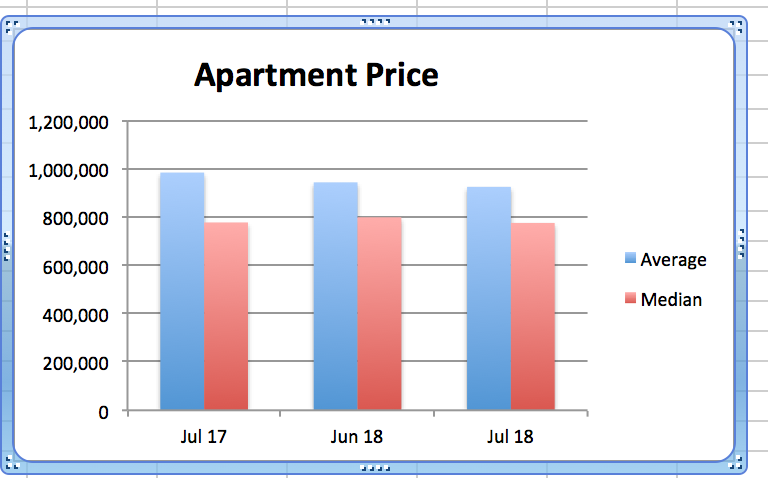 Westside apartment supply remained the same in July 1192 v. 1191 units in June and this is up 52% from the 785 listings we had July 2017. 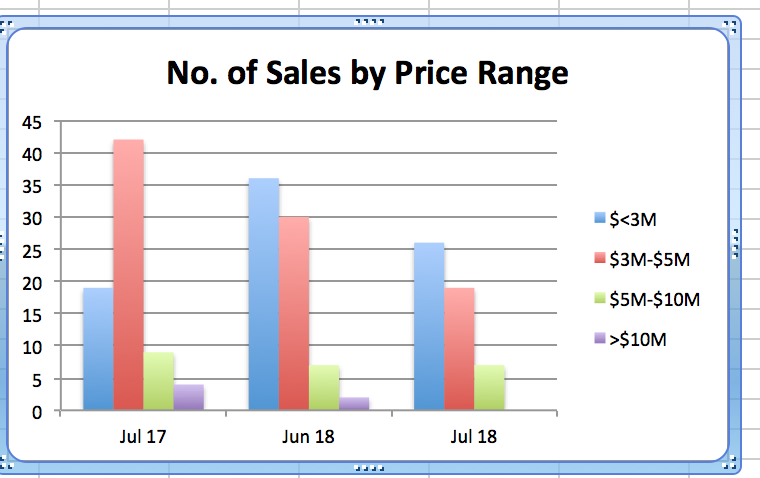 Demand dropped 10% to 294 sales in July from 327 in June 2018 and this is down 26% from 398 sales in July 2017. 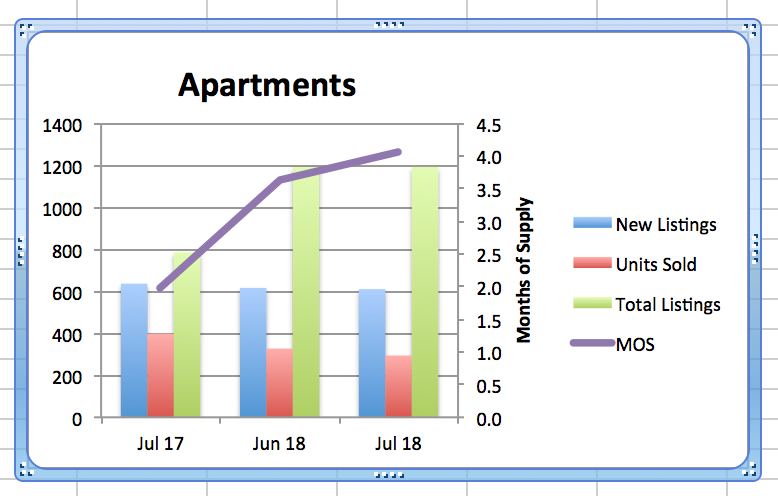 MOS in July is 4.1 up from 3.6 in June and up from 2.0 last July 2017. These levels seem low but they are trending up and this puts downward pressure on prices. The average price dropped 2% to $924K in July from $943K in June and it dropped 6% from $983K in July 2017. The median price increased 3% from last month and remained the same as July 2017. Westside townhouse supply increased 9% this June to 279 homes from 255 in May and that's up 86% from 150 in June 2017. Demand in June is down 9% to 50 units from 55 in May but this is down 23% from the 69 sales last June 2017. 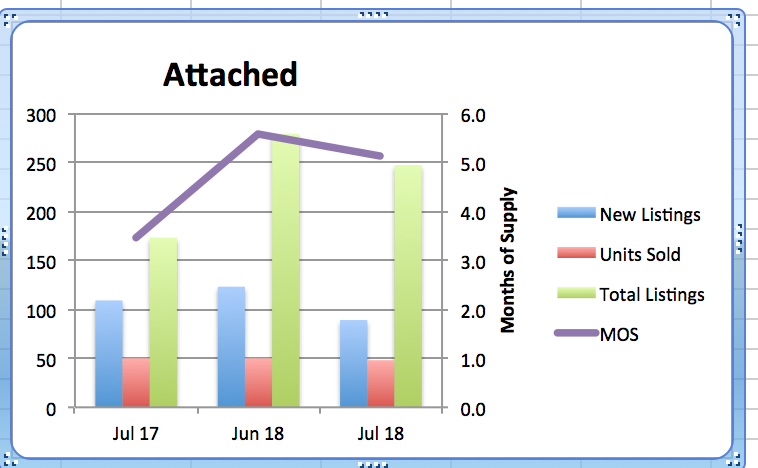 With supply up and demand down the current MOS increased to 5.6 from 4.6 in May and up 254% from 2.2 last June 2017. As you would expect average prices decreased 16% to $1.319M from $1.567M in May and were down 7% from $1.418M last June 2017. Median prices decreased 18% to $1.25M in June from $1.53M in May and this was down 8% from June 2017. Detached, Attached and Apartments on the westside are now all experiencing price reductions and while this is creating good buying opportunities, buyers are holding off in anticipation of further declines. This will exacerbate the decline and soften prices further. The second quarter is usually the busiest time of the year with July through mid Sept. usually quieter months. This year it has been quiet throughout and with interest rates rising it appears there is no relief in sight. Mortgage holders who renew in the near future may have trouble re-qualifying under the new mortgage stress test rules and some of those homeowners may be forced out of their homes. Other homeowners who bought long ago and are ready to make life changes are also selling and taking what the market will bear. 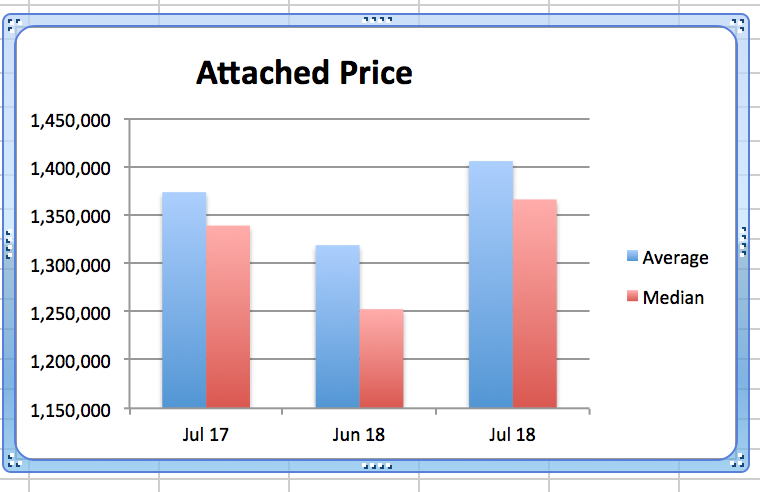 This is showing us where the market price is and those sellers not prepared to accept those reduced numbers are having a quiet time. We may have a few hard years in front of us and it is hard to know what will trigger a recovery (maybe a new government?) but Vancouver is still a great place to live so it is all about when and not if it will recover.